Leading health blogger Jimmy Moore and researcher and internist Dr. Eric C. Westman join forces again to explain the powerful therapeutic effects of a ketogenic diet--one that combines a customized carbohydrate restriction, moderation of protein intake, and real food-based fats--which is emerging in the scientific literature as a means for improving a wide range of diseases, from Type 2 diabetes to Alzheimer's and more. Simply eating a low-carb diet alone isn't enough, and Moore and Westman tell you why. Have you looked at a low-carb diet simply as a means to lose weight? What if you learned that combining a low-carb nutritional approach with a high fat intake produces a powerful therapeutic effect on a wide variety of health conditions that most people think requires medication to control? That’s what Keto Clarity is all about. Jimmy Moore, the world’s leading low-carb diet blogger and podcaster, has reunited with his Cholesterol Clarity coauthor Dr. Eric C. Westman, a practicing internist and low-carb diet researcher, to bring you the crystal-clear information you need to understand what a ketogenic diet is all about and why it may be the missing element in your pursuit of optimal health. This book includes exclusive interviews from twenty of the world’s foremost authorities from various fields bringing their depth of expertise and experience using this nutritional approach. Moore and Westman clearly explain why ketosis is normal, how this nutritional approach is being used therapeutically by many medical professionals, a step-by-step guide to help you produce more ketones and track your progress, real life success stories of people using a ketogenic diet, and more. The solid evidence for nutritional ketosis in dealing with many of the chronic health problems of our day is presented, including: epilepsy, Type 2 diabetes, obesity, cardiovascular disease, metabolic syndrome, polycystic ovarian syndrome (PCOS), irritable bowel syndrome (IBS), heartburn (GERD), nonalcoholic fatty liver disease (NAFLD). The good evidence for ketogenic diets is also shared in dealing with Alzheimer's Disease (AD), Parkinson’s Disease, dementia, mental illness, schizophrenia, bipolar, depression, narcolepsy, and sleep disorders. Plus, you'll get the details on the emerging science that is showing great promise in treating cancer, autism, migraines, chronic pain, brain injury, stroke, kidney disease and so much more. Keto Clarity is your definitive guide to the benefits of a low-carb, high-fat diet. Full details on Jimmy Moore's yearlong n=1 scientific experiment of nutritional ketosis, in which he used sophisticated blood testing technology to track and monitor his production of ketones and blood sugar to achieve rather remarkable effects on his weight and health, is also presented as well as food shopping lists, 25+ low-carb, high-fat recipes, and a 21-day meal plan to get you going on your ketogenic lifestyle change. 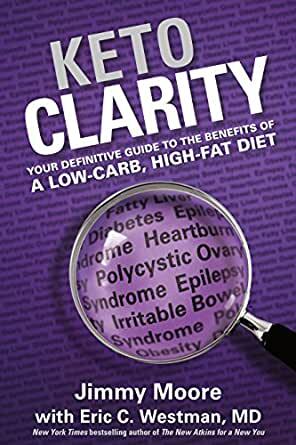 Keto Clarity gives you a whole new perspective on the work that the late, great Dr. Robert C. Atkins started in earnest with his promotion of the low-carb approach beginning in the 1960s. That revolution continues boldly in this book designed to shift your paradigm on diet and health forever! 5.0 out of 5 starsIt's time to turn the diet debate on its head. Looking for a diet that makes you feel amazing AND helps you lose weight? Is it time to turn the health debate on its head? The weight loss industry booms and people get fatter but thankfully there is now a groundswell of interest in an alternative to the traditional formula of eat less, move more. An alternative that allows us to work with our bodies, rather than against them. An alternative that gives us robust health, mental focus and freedom from cravings and insatiable hunger. Author and world renowned podcaster, Jimmy Moore has combined forces yet again with Dr Eric Westman to write a book that is sure to become one of the seminal works on nutritional ketosis. Written in a practical, accessible style, this book provides the reader with everything they need to adopt this lifestyle change and way of eating. Many practical questions are answered and the exciting ways in which nutritional ketosis is used to treat a wide range of diseases is presented. Combining practical advice, first hand experience and a wealth of information, this book is a necessary read for anyone who is seriously looking for a way out of diet failure to good health. I rarely write reviews on books even though I read so much. But I was prompted to write a review on this book because it really clearly made a good case for LCHF lifestyle. This was the first book I read on the subject whilst having read a number of books on low carb diets/lifestyle. I find this book both easy to understand and appears scientifically sound. Personally I have already benefitted from incorporating the principles in this book even though it has only been 2 weeks. Very interesting and informative book that is easy to read. Written without a plethora of technical jargon the book is able to be read and absorbed quickly. Keto clarity challenges the status quo about what we eat. I personally have adopted the method of eating and have been pleased with my fat loss but most importantly I feel full all afternoon which is when I used to crave sugar. I very rarely have cravings anymore. I am into week 6! Easy to understand, full explanation of Keto. Also has a benefit of the contribution of many practitioners, based on not just theories, but working, real life experiences. Love the recipes and the 21 day starter program. Having read a number of books now on Ketogenic diets and having ventured into nutritional ketosis, mainly to enjoy the benefits of doing endurance events without carb supplementation, I have found this book to provide that answers to a number of the questions I have raised about the 'how to' and 'what is happening' on my journey. Thank you Jimmy and Eric, a well written and easy to read reference book. Ordered the book early this year just waiting on delivery down under. Purchased the kindle version and was not disappointed. Thought provoking, maybe we all have been brainwashed for 25 years. 3.0 out of 5 starsAlternative nutrition. Who'd have thought that eating fat could make you thin? Makes perfect sense scientifically and it's interesting to see what Ketons can do for you. Have been doing LCHF for 6 months and feel fantastic!